Other than complaints and appeals, we can be contacted via email: stscertification@stengg.com or by phone at 6660 7682. All complaints shall go to General Manager who will designate a manager (if the Department Manager is involved) who is independent of the activities related to the complaint, to further investigate the complaint. Any valid complaint is related to a certified client, Department Manager may bring the complaint to the attention of the certified client as appropriate and review all necessary information to examine the effectiveness of the certified management system of the client. c) Rejecting the complaint if deemed to be unreasonable or impracticable. The final decision to be communicated to the complainant shall be approved by General Manager and Department manager shall keep the complainant informed on the progress & outcome of action taken. Complaints that are not closed out within a timeframe documented and agreed with the complainant shall be escalated to STS General Manager to ensure that the complaint receives the appropriate priority. Complaints that are not closed out within three (3) months of that agreed timeframe shall be brought to the attention of accreditation body (JAS-ANZ/SAC). If a complainant is dissatisfied with the final outcome of the STS Certification’s complaints handling process, the complainant may refer the complaint to accreditation body (JAS-ANZ/SAC). The Department manager may take into account the recommendations made by accreditation body and issues its decision with the approval of General Manager, which shall be final. 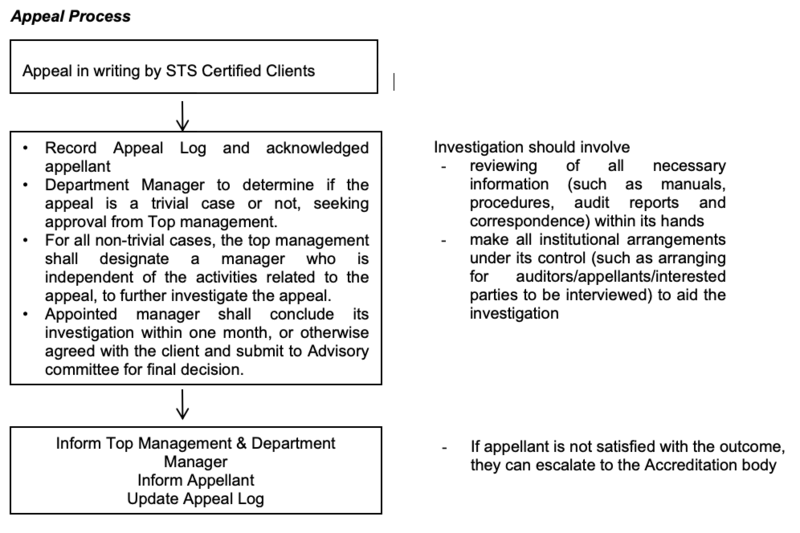 If the issue under dispute has potential to affect the certification decision, Department Manager shall give certified client the opportunity to raise an Appeal which shall go through the appeals handling process. STS would determine, together with the client and the complainant, whether and, if so to what extent, the subject of the complaint and its resolution made public. Department Manager shall settle all valid outstanding complaints and update the Complaints Log (in spreadsheet format). If corrective/preventive action has been initiated, the Complaints Log shall be updated with related corrective action/ preventive action form number. All suspensions, withdrawals and reductions in scope shall be communicated, in writing, to the client. Notice of suspensions, withdrawals, reductions in scope and termination will be notified to client after certification decision of awards committee. The client shall be given the opportunity to raise an Appeal during this 2-week notice period and give due consideration to the appeal to re-evaluate whether the decision to suspend/withdraw/reduction of scope is justifiable. Client’s management system has persistently or seriously failed to meet certification requirements. Client ceases to have manufacturing/service operations for the preceding 1 year. All contracts for certification services with the Client shall include the clause that upon suspension, the Client shall refrain from further promotion of its certification until the suspension has been officially lifted. All contracts for certification services with the Client shall include the clause that upon withdrawal, the Client shall cease to make any references to being certified in any manner of advertising. All suspensions shall be imposed for six (6) months with approval by awards committee. Failure to rectify the conditions on suspension will lead to termination or reduction of scope whichever is applicable. Further suspension beyond six (6) months (less than 12 months) with valid justification endorsed Awards committee. A Stage 2 audit shall be conducted to ensure system in place within the extended suspension period. reduce the scope of certification to exclude that part of the management system which failed to meet the conditions necessary for lifting the suspension. Should termination be executed for the Client, then process on termination will be followed. Client not wishing to maintain the certification service provided by STS, the certification shall be withdrawn upon a written request from the client using the company official letter head/official email. Client shall relinquish Certificate to the STS upon withdrawal of certification and shall cease to make any references to being certified in any manner of advertising. Clients who had voluntarily withdrawn their certification may re-apply as a fresh applicant at any time. Clients who did not continue upon expiry of certificate are reflected as “Expired” in publication list. Failure of client to provide the corrective actions after repeated follow up by the lead auditor and the matter is escalated to Head CSD. Client ceases to have manufacturing/service operations for the preceding 2 years. Clients whose certification was terminated shall need to re-apply as a fresh applicant and shall be re-assessed as a fresh application. Suspended certifications shall be restored within the 6-month period for meeting the certification requirement, if all conditions are satisfied.